VII. Piaculum - Statements made to each deity addressed in ceremony for reparation for any unnoticed error in the ceremony. Vesta is always addressed last. On this post, I would like to discuss the first stage, Purificatio. What are the essential components of this stage? What text should be used? Should there be multiple versions of the text agreed upon? What should be done with the water? How do we define "pure water". Does the altar need to be purified? Does anything else need to be purified? Should certain gestures be defined? What parts of this stage should be the same and consistent between all ceremonies conducted for the sacra publica? I'm interested in hearing your ideas. Later I will share my thoughts. Water should be aspersed over the altar and the surrounding space. Woolen fillets or februa are wrapped around the altar three times. Pure water comes from a living source, i.e, a stream, river, etc and not a stagnant one such as a pond. I've seen arguments against using tap water because it comes into contact with metal, but I've also seen arguments for it because it flows and therefore can be similarly defined as "living". The alternative would be to obtain it from a local source in one's locale if possible or otherwise purchasing spring water which in itself also comes into contact with metal. I will typically purchase a bottle of spring water as it adds a certain tone of being willing to give up something (in this case money) to provide the Gods with the best. I agree with Nero about the running water. However, I just use my tap water or when I am in Rome, I go to the public fountains to get my water. I also believe that everything on the altar should be cleansed before the next use. I usually do this at night before I go to sleep. I wash everything (if there was wine, which their usually is- being the sacerdos for Liber! - or any other food offering) including the altar and statues. Okay, some good ideas have been added. I also received from private messages and emails. I have included all ideas which are consistent with the known traditions. I would like to summarize what we have talked about regarding Purificatio. To enter into a state of mind and physical disposition fitting for a feast with the Gods. One should emotionally be prepared with good intent and a focused mind. This allows the ritual to be conducted properly and genuinely with good faith. 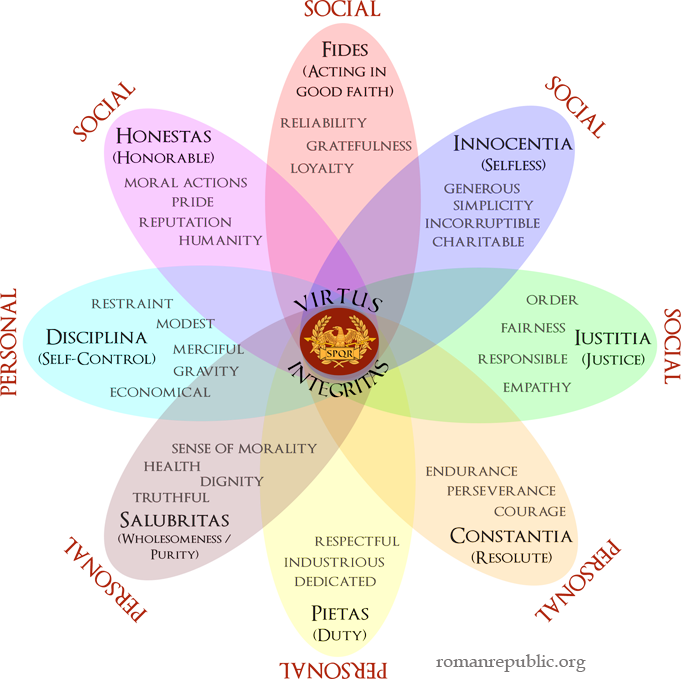 Throughout the Purificatio one should focus on the coming ritualistic tasks and the gravity of the actions to come. One should think of the Roman virtues (http://romanrepublic.org/wip/img/virtues.png) when preparing to coming before the Gods and exhibit these virtues during and after the ceremony. In doing so one imitates the Gods and is pleasing. I. The individual(s) conducting the rite should be physically clean. Bathing before conducting a ceremony is encouraged. During Purificatio the hands should be ceremoniously washed in pure flowing water. Pure water is defined as water from a clean source, such as clean municipal water safe for drinking, bottled water from a spring, water from rivers and creeks, water collected from freshly collected rain/snow. Sea water, water from stagnant sources such as ponds and contaminated water are not to be used unless indicated by the particular ceremony. II. Both hands should be washed in water using a clean basin or bowl. Hands should be thoroughly dried using a clean towel at the end of Purificatio. III. The space where offerings to the Gods will be made and any images or instruments used during a ritual should be sprinkled with pure water. IV. Anything unclean should be removed from the space where the ceremony is to take place. I. Sexual abstinence is not mandated but encouraged for certain rituals as indicated. II. Fasting is not mandated but encouraged for certain rituals as indicated. III. Some substances may be optionally burned to purify the ceremonial space. Frankincense, laurel/bay, mint, verbena, and sulfur are all acceptable choices. IV. Strips or wool may be wrapped around the ceremonial altar an odd number of times (min 3 times) and in a clockwise direction as part of the purification of a ceremonial space. This should occur after the hands are ceremonially washed and before any incense in burned. These words are to be spoken while or immediately after the hands are washed. I. May this water cleanse my body of impurities, as lead is changed to gold. May this water cleanse my body of impurities, as the rain cleanses the air. Purify my mind. Purify my body. Purify my heart. It is so. II. May this water cast out all impurities from my substance as from lead to gold, as the falling rain cleanses the air. Thus, I am cleansed and at peace and made whole before the Gods. I am tranquil and before the divinities which it is pious to invoke and stand prepared, humble and with good faith. It is so. III. May this unspoiled and humble water rinse away my impurities. I perform this act in preparation to come before you, the mighty known and unknown divinities, I desire to be pure and to be pleasing. May this simple water, the lifeblood of all mortal things, remove any contamination from my body. May it symbolically cleanse my heart and mind and remind me of the virtues as I come before you. From this act, I hope that my presence is pleasing and non-offensive to you. May I be worthy to offer you my praise and invoke your generous benevolence. It is so. Do any cultores wish to add or change anything to the above? I like the option of the WORDS TO BE SPOKEN. It adds variation. This is just my view, but tap water is not living water. with the chemical treatment, and the additives the water is not hale and whole. the essence of it is gone. I had one time herd if the offering is not good enough for your body, what do you think the Diis think about what seconds you give them. but it is just my thought, and I am not trying to say anyone is doing anything wrong. Yes, I can appreciate your view. You certainly have a point. Personally I use bottled spring water. I only use such water that is bottled in glass. But that is just my personal thing. I think the main point is that the water is not from a stagnant source (eg. pond, pool, etc) and that it is pure water, or as pure as possible (eg. not sea water or some other mixture). Regarding your comments on municipal water, I think this is very variable. In some locations municiple water comes from a spring source and is only minimally treated. If that is the case such water is not all that different from that delivered by the ancient aqueducts into Rome. I think this is probably as pure, if not more so because of modern technology, as that water used by the ancients and collected at the local fountain. But you are also right. Some municiple water is very lacking. Such a thing is very common in most countries. Bottomline? I think your line of questioning, "would you drink it?" is very appropriate. If the answer is no, then certainly you should do better for the divine Gods and Goddesses. I think this is very practical, dare I say Roman solution to this matter. Any additional perspectives?